Simpich Showcase will join in the bicentenary celebration with a lavish two-part festival. Our summer offerings will commence 26 June with two Dickens marionette plays, 'Great Expectations' and 'Oliver Twist', presented in repertoire in our theatre and a plethora of special events and exhibits hosted in our museum and gallery. The festivities will culminate in late fall with additional holiday themed Dickens proceedings including our marionette production of 'A Christmas Carol'. 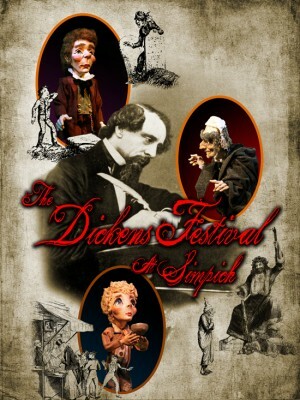 Dickens Festival Highlights Include: award-winning marionette productions of Dickens’s works, Dickens exhibits featuring Simpich character dolls, the all (New!) Old Curiosity Shoppe Special “Dickens & Puppetry” workshops, backstage tours, afternoon teas, special Dickens readings and character studies, toy theatre demonstrations, costume events contests and treasure hunts.